#VoteforMiracles Nov. 27 – Dec. 18 and Helen DeVos Children’s Hospital could win $50k from Credit Unions for Kids! For the fourth year in a row, Credit Unions for Kids is offering up $50,000 in prize money to the winning Children’s Miracle Network Hospital — how do we win? Whatever hospital with the most votes wins the $$! You can Vote for Miracles and help Helen DeVos Children’s Hospital (HDVCH) win the $50,000 from Credit Unions for Kids Nov. 17 – Dec. 18. This money would help support programs that promote clinical excellence, provide compassion for our patients and families, and fund research and innovation that advances the level of care we are able to provide. As an example, the HDVCH Oral Cleft Program is a premiere program right here in West Michigan and around the globe. This last year, because of philanthropy, we enhanced this area of care with the addition of a dermatologist. Since 1996, Credit Unions for Kids has raised more than $170 million for Children’s Miracle Network Hospitals. These vital funds go to help kids like Graylyn. The day Graylyn was born, she was whisked away by the neonatal intensive care team. Three days after, Graylyn’s oxygen levels trended in the wrong direction. At 8 days old, she underwent her first surgery. Marcus Haw, MD, congenital cardiothoracic surgeon at Helen DeVos Children’s Hospital, inserted a bovine (cow tissue) heart valve into Graylyn’s tiny chest cavity. At 4 months old, she returned for a second heart surgery where Dr. Haw repaired her aorta. Later, something changed with Graylyn. Her legs became stiff. If she was on her back, her legs would point toward the sky, her feet turned outward. That’s when the diagnosis of cauda equine syndrome came. 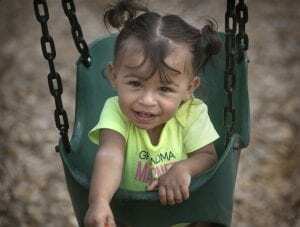 Help us win $50,000 and Vote for Miracles to help kids like Graylyn at voteformiracles.org Nov. 27 – Dec. 18! Next post: #VoteForMiracles now through Dec. 18 and Cottage Children's Medical Center could win $50k from Credit Unions for Kids!